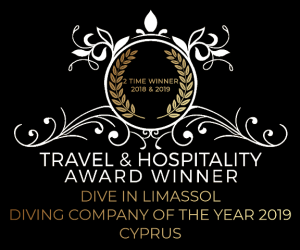 Dive In Limassol are very proud to announce that not only were we nominated, but we have won these prestigious awards for Best Diving Company in Cyprus 2019. 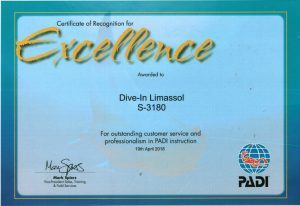 In addition to these 2 Awards, in April 2018, PADI Awarded us for our Excellence in Customer Service and Professionalism In PADI Training. These Awards just go to prove that for the best training and diving experiences Dive In Limassol leads the way. Diver Training – Its so Important! A recent news article reported on a diving incident that should never happen if standards and procedures were followed correctly when diving and if the diver had remembered the training. We have noticed over the last few years how many people we have had book diving with us as an Open Water diver and in fact they haven’t been taught, or remembered, even the basic relevant skills and safety checks necessary for the level of qualification they had paid for! Students, without having any prior knowledge about diving put their trust in the Instructor and Dive Centre to do their job as per the training standards of the Diving Agency they represent. Dive In always sticks strictly to PADI’S Standards when teaching and guiding dives. We teach all of our customers to a competent level. Indeed, in 24 years we have taught nearly 12,000 PADI Courses and have a safety record to be envious of, in addition as one of the top Dive Centres in Cyprus we have taught over 1,500 people Instructor level credentials. 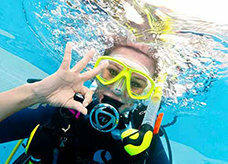 So if you are looking to learn to dive, ensure that the Dive Centre and Instructors explain the Course in detail to you, including the skills they will teach you and when you are asked to sign the record card, ensure you check that all the skills were taught to you and that you have mastered them! We at Dive In use all PADI produced teaching materials including the planning dive slate for your final Open Water dive, a final opportunity for you to check you are happy and comfortable with all the skills we have taught you. Diving is safe and fun when taught and experienced correctly. For more information on Courses, check out our website and contact us to explain everything to you. Skip the gym and hit the high seas! Scuba diving is the hot new workout Jessica Alba, Sandra Bullock, Katie Holmes and Nina Dobrev love. In fact, just 30 minutes of scuba diving can burn up to 400 calories for the average woman. Most diving excursions last about 30 to 45 minutes, so depending on the diver’s experience level and the type of dive, it’s not uncommon to burn 500+ calories during one workout. Read the full story at Shape Magazine written by Jennipher Walters a certified personal trainer, lifestyle and weight management coach and group exercise instructor, she also holds an MA in health journalism and regularly writes about all things fitness and wellness for various online publications. As a scuba diver we must look after our equipment so it can look after us underwater! During the PADI Open Water Course, when you started diving, there is a whole section on equipment and how to care for it, hopefully your Instructor would have gone through the correct way to wash the dive gear. Although in some Countries, all this is done for you by the staff. 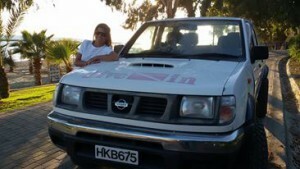 This should not have been the case as it is a part of the Open Water Course, as it is with the PADI Scuba Diver Course. Its covered in the very first chapter. At Dive In, when we train customers we do go through the correct way to wash the diving equipment. After each dive, whether it be in a pool or the sea, the equipment needs to be washed properly. Well both chlorine and salt water can damage the gear. Chlorine is a type of bleach, and salt in the water when dry will turn into salt crystals. This will damage BCD’s, wetsuits and of course the regulators. So how do you wash your gear after each dive? Ensure that the dust cap is in place. Why it is called a dust cap is strange as its main purpose is to stop water entering the 1st stage of the regulator. Failure to have this in place and getting water in the 1st stage, will mean that the regulator will need servicing. This is costly, and most Dive Centre’s will charge you for this!! Firstly rinse the regulators in clean fresh water. Do not push the purge button when doing this, the purge should never be push when in water unless connected to a cylinder that has been turned on. Shake the excess water out and hang to dry. Next comes the BCD. Rinse in the fresh water, put water into the BCD via the manual inflation tube, by holding down the button that releases the air whist filling with the water. Turn upside down and swill the water around inside the BCD. Whilst still upside down empty all of the water out via the inflator, push both the inflate and deflate buttons to clean them thoroughly. Turn the right way up and pull the dump valve at the bottom to ensure all the water is out. Hang up to dry after manually blowing air into the BCD. Wetsuits are next. Thoroughly rinse, inside out and hang to dry. Make such that all the equipment drys in the shade, as direct sunlight will bleach your gear. Now your boots and lastly the weight belt. Remember this order for hygiene! Some divers do pee in their wetsuits and who wants to rinse their regulators in anther divers pee????? Welcome to Dive In. My name is Jonathan, I own and run the Dive Center along with daughter Chloe and my partner Debbie. Both Chloe and my self are instructors, whilst Debbie runs the office administration, accounts and shop sales. Photo to the left of me & Chloe is of a 2015 campaign from PADI. At Dive in we just love diving, it’s great fun! Our planet is 70% water and yet most of us don’t experience that. So change your life today. Learn to dive! We teach from Bubble Makers, Discover Scuba Diving, Scuba Divers, Open Water Divers through to Advanced Level Divers, Rescue onto the Professional Route in Diving being, Dive Master, Assistant Instructor & Instructor. It’s not too late to add one more to your list. Why not this year make one of your resolutions to change your life and bring some adventure into it, along with experiencing the peaceful & amazing underwater world, meet new friends above and below the water. It’s easy, all you need to do is learn to Scuba Dive. It opens us up to a whole new world of meeting new people, it also gives us the opportunity to meet and experience a fantastic array of marine life and be part of their world. The feeling of “weightlessness” is completely de stressing & relaxing, no mobiles or emails under water, so you cannot be disturbed, complete time out, which is why most people dive. It helps us to keep fit by using all of our bodies muscles, even though it feels like you are not really working out you do burn calories, the fact that you are wearing a neoprene suit means you are sweating without realising it, and just by kicking your fins to pull you forward, it is using your bodies strength & stamina (cardio) all this without the hard work out you need to do in the gym, in fact PADI have been researching this and estimate that a 30 min shore dive in temperate water can burn through as many as 300 calories, which is the same as jogging but with out the hard sweat! Drops Of Breath is the first ever in the world underwater dance performance. The idea and concept has been brought together from Choreographers Sophie Bulbulyan (France) and Apostolia Papadamaki (Greece) in collaboration with Lia Haraki (Cyprus) and artists from 10 countries to present an spectacular underwater dance-visual. This first time underwater show was recently shown in one of the most beautiful parts of the Mediterranean at Cape Sounion beach, the ancient Greek temple of Poseidon which is at the edge of Attica land looking over the Aegean Sea. There were 14 performers from France, Greece and Cyprus and Dive In Limassol had he great pleasure in being asked to sponsor the event along with training one of the dancers/underwater performers. On the 1st November 2015 Dive In were invited to meet everyone involved and see the filmed version of the event shown at The Old Vinegar House in Limassol’s old town. What is absolutely wonderful about the project is that it is inspiring to us all that anything can be possible if minds come together coupled with some hard work and determination. 2016 the project will hopefully be coming to Cyprus waters. Below is a trailer of the event. Confined Water Training – what is it? Copyright 2019. JPW Dive-In Limassol Ltd. Trading As Dive-In Limassol. All Rights Reserved.